This magical Zanzibar spice island lies just 35 km of the coast of Tanzania with a total area of only 1464 Square Kilometres with palm fringed beaches and turquoise sea with a strong Arabic culture. 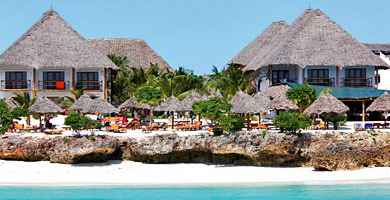 Zanzibar is a true tropical island lying just 6 degrees south of the equator giving it superb weather all year round. Take an excursion and swim with the Dolphins in these warm tropical waters. Makes for popular paradise island holidays. 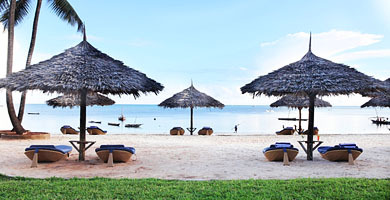 At Selftours we design Zanzibar Island holiday packages which are tailor-made around island beach holidays. Zanzibar Island Holiday Packages are more than just a soft white sandy beach holidays, but rather better suited to those who want to do more than just spend an entire holidays on the beach. So much more to do, explore the history of Stone Town, the Sultans of Zanzibar, the Sultans palace, the House of Wonders and the Slave Trade market. Enjoy a fascinating guided holiday spice tour while bargaining for some interesting tropical island holiday mementos. Enjoy swimming with Dolphins, visit and snorkel Prison Island feed the giant Tortoises. Finally relax on your tropical paradise island beach, soak up the sun or enjoy various water sports including Scuba Diving Zanzibar many coral reefs, or for the fisherman there is the world famous deep sea game fishing on offer in the Pemba Channel on the west coast of Zanzibar island where all the large game fish can be found. Zanzibar Island Holiday Packages offer a large variety of activities can make for that perfect paradise island holiday in the sun. 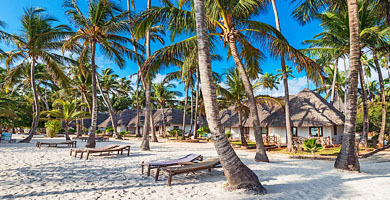 Zanzibar island holidays are all about warm sun drenched white paradise island beaches, palm trees whistling in the breeze, and crystal clear tropical waters with colourful coral reefs teaming with a kaleidoscope of tropical fish waiting for you to snorkel or scuba dive on the reef with them. 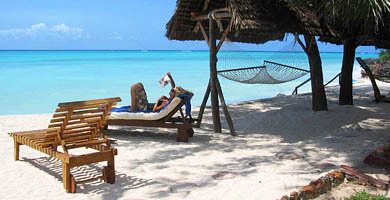 If you are looking for a honeymoon, Selftours will designs your perfect Zanzibar honeymoon package just for you. Zanzibar's brilliant soft white beaches lapped by the warm turquoise waters of the Indian Ocean provide the perfect place to relax, soak up the sun and take a break from some busy sightseeing as the sun settles into the Indian Ocean. You can look forward to Zanzibar accommodation to being on par with International standards. 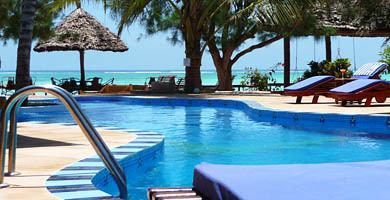 From Budget beach chalet accommodation up to 5* accommodation, Zanzibar can cater for your every need. 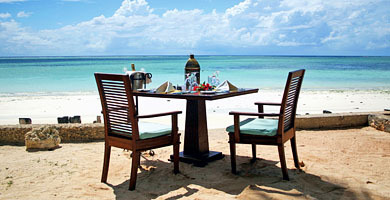 We suggest at least two days in Zanzibar Stone Town and another 4 to 5 days at a Zanzibar beach hotel. A holiday on Zanzibar Island gives you the best of both worlds - 'Retail Therapy', exploration, and a relaxing tropical island sun tan. Whatever your dream is of a tropical paradise island holiday, Selftours design personalised individual Zanzibar Island Holiday Packages meeting a couples or a families dream holiday within your holiday budget. Selftours' Zanzibar vacation packages include international airfares, airport transfers, with a choice of, bed and breakfast, half board or full board packages to suit your individual requirements. 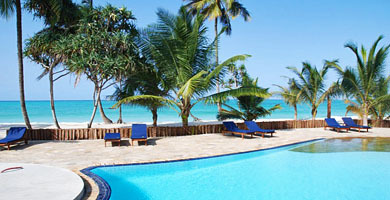 Gemma Dell Est is located on the North West coast of Zanzibar, on a magnificent stretch of deep water beach. The hotel has been styled on the modern sophisticated European style, the restaurant area is beautifully decorated using glass windows and water features, all very chic and modern. One of the most stunning features of the resort is the large entertainment area. The pier runs out some 100m into the ocean and provides a stunning place to enjoy cocktails during the day, sundowners at sunset or a late night drink. From the deck, you can watch the fish swimming in the floodlit ocean. 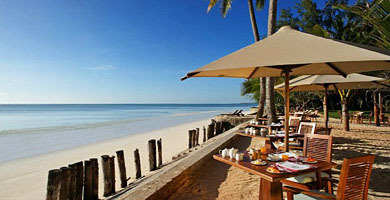 Bluebay Beach Resort & Spa is situated on the finest wide, white, sandy beach on the island of Zanzibar. 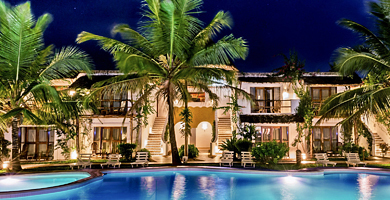 Located on the East Coast in an area known as Kiwengwa, the hotel is only 35 minutes drive from Stone Town and the airport on a good tarmac road to within meters from the hotel. The hotel opened in December 1999, and was fully operational for the millennium. 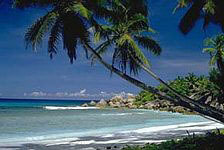 The Hotel offers a wide range of facilities in addition to the magic Indian Ocean "Spice Island" itself. The hotel is situated on the most beautiful 25 acre site with its bedroom cottages located on rising ground overlooking verdant gardens, the public areas, the pool, the more than 1,000 beautiful palm trees, the sparkling white beach and the azure sea with its coral reef offering particularly warm and safe swimming. A snow white sandy beach set on the edge of a calm Turquoise sea - what more can I say? Whether you are looking for a special family vacation, a romantic getaway, a honeymoon, or just a top class 4* holiday - you have found it - The Hilton's Beach hotel will exceed all your expectations. Our all inclusive package covers everything, all meals, including High Tea at 4.30, local drinks, transfers, right down to your departure taxes are include. A free fully stocked mini-bar, and daily fresh fruit basket in your room, to enhance your stay further - this is definitely one of the best Island holidays deals available. My Blue Hotel is situated in Nungwi the most north area of the island of Zanzibar on one of the many magnificent white beaches. Famous for its village live and many crafts, it is the area where Dhows have been built for 100s of years. 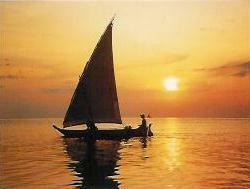 (Swahili sail boats) Stroll around the village try your and at building a Dhow using primitive and ancient tools. It is also one of the main fishing areas. The hotel upholds the atmosphere of Zanzibar's cultural design yet the accommodation is both modern and comfortable. With all the comforts one would expect from a 4* Hotel. Enjoy the soft white sandy beaches by day and in the early evening Sip cocktails while watching the sunset into the ocean on the horizon. 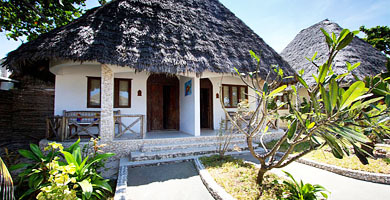 Mnarani Beach Cottages is a beach resort hotel, located on the northernmost tip of Zanzibar Island in the village of Nungwi, next to the old lighthouse. “Mnarani” means “lighthouse” in Swahili. At Mnarani you will be able to develop the art of doing nothing on a beautiful tropical island beach lapped by the warm turquoise waters of the Indian ocean. Indulge in relaxation. Stretch out in the sun with a book form our well stocked library or a relaxing sauna and massage. A short walk to the light house or to the Sea Turtle Aquarium. For the more adventurous there is a long list of activities from snorkeling or diving Mnemba island's reef to deep sea fishing, various island tours including the very popular Spice Island & Stone Town combination are also available. Speak to reception for a full program of enjoyments that await you. Coral Rock Zanzibar has been described as the jewel of Jambiani. The hotel’s exquisite location is unrivaled. Built atop an ancient coral rock that juts out into the ocean and flanked by two striking beaches. The hotel offers the ideal tropical island holiday. Guests often spend hours staring out at the water where the changing of the tides reveal 100 shades of blue. Whether in the restaurant, bar or any room in the hotel, visitors can experience the stunning beauty of these same sea views. 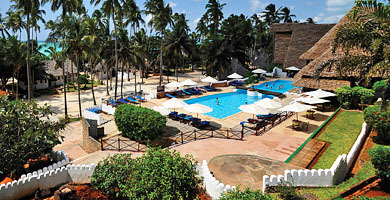 3* Mapenzi Beach hotel offers 87 spacious en-suite rooms – The beach hotel is situated on the North East coast of Zanzibar approximately 40 minutes from the airport south of Stone Town. 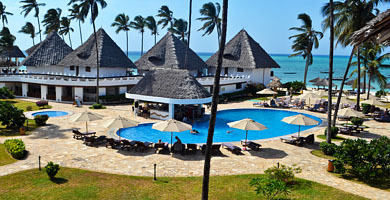 Mapenzi beach hotel is a very comfortable spacious hotel with traditional but modern thatch cottages. Mapenzi has a very wide beach front offering more privacy and less crowding. The beach is a soft white sand lapped by the warm sparkling turquoise waters of the Indian ocean with many natural palm trees to offer some shade. Enjoy strolling through the beautiful gardens stretch out on a sun bed, bathe in the blue pool or challenge yourself in one of the many activities or water sports offered by the local entertainment team. 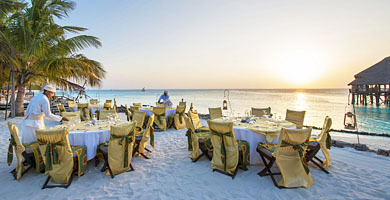 Dining facilities include a main buffet restaurant, a beach pizzeria, and a’ la carte restaurant and 2 bars offering refreshing drinks, snacks and cocktails in the evening. Amaan Bungalows is a laid-back beach hotel with splendid surroundings, where their friendly staff will do everything they can to ensure that your holiday is not only delightful, but also very special and memorable. Located in Nungwi, a beachfront on the north western tip of the island, with a wide range of facilities and leisure options. Amaan Bungalows embraces families, couples and honeymooners, the 86 guest rooms, including 16 sea view rooms that literally catch the waves at high tide, 32 pool view rooms, 19 deluxe rooms and 19 garden rooms, are set amid a landscaped tropical oasis dotted with coconut palms, shady trees, and sweet-scented flowers. If you have not been to Zanzibar you are missing out on something special in life. Enjoy an entertaining and educational Zanzibar spice tour of the Spice plantations. You will have the opportunity to pick, smell, and savor fruits and spices which you have probably never seen on the supermarket shelf and some that you have in your kitchen but would never have recognise on the plant. Many ladies will be fascinated as what those every day spices in their kitchens actually look like in the wild. The aroma of cloves, cinnamon, nutmeg, vanilla and other fragrance tantalize your senses. Cloves, star fruit, tangerine trees, coco, lemon grass, mangosteen, 'lipstick trees', to name but a few are what you can expect to see! Perhaps you will be tempted to buying a basket of Zanzibar spices to take home with you. A City Tour of Zanzibar Stone Town takes you down the fascinating ancient streets where, with little imagination, history comes to life. Visit the Sultan's Palace, the House of Wonders, the Slave Market, Dr Livingston’s House, & Freddy Mercury's' place of birth. Shopping in Stone Town - Strike up a bargain with one of the many merchants selling some exotic wares. Don't forget that they expect you to Haggle over the price, if you don't, they will be sadly disappointed that you do not participate in the fun!! Boat trips to Prison Island were captured slaves where once concealed from the British Navy. 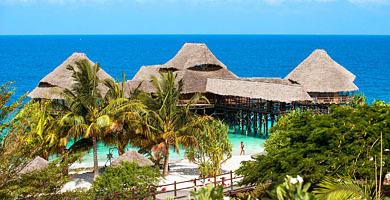 Travel to Zanzibar island on a magical vacation and experience all these exciting fascinations. Whether you are an ankle deep paddler or want more adventure and scuba dive or snorkel the many coral reefs or enjoy a day deep sea fishing. You could also arrange at your hotel a day trip out to Swim with the Dolphins. 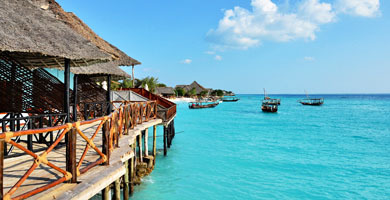 Zanzibar Island vacations offers something for everybody. All equipment is normally provided. 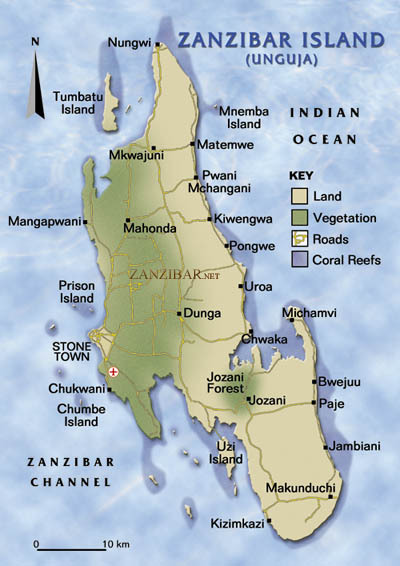 Health - Malaria has been virtually eradicated in Zanzibar over the last 10 years and is no longer considered a malaria area. However, we hasten to point out that you should consult your Doctor for the latest information on the situation. For your comfort an insect spray and a body spray (Tabard) to repel insects is always a good idea in the tropics but not essential. Visas - Can be purchased at point of entry for US $ 50 - South African Passport holders do not need a Visa (Jan 2018). Make sure you have the US Dollars in Cash on arrival. Always carry a pen to complete any documents required. Always a good idea to carry some US $1 bills, very handy for tipping. Currency - Tanzania Shillings is the local currency but US $ are widely accepted. 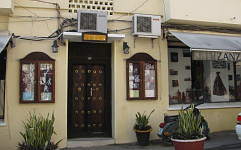 Banking - There are Bank ATM machines in Stone Town. Traveler's cheques are not readily accepted. Credit cards can be used at banks and many hotels, though a surcharge of 5% may be imposed. The preferred cash currency to carry is the US $ which is readily accepted. Drinking Water - A 2 litre bottle of spring water may cost you several times more at your hotel as opposed to the price in the market - ask your driver to stop at a shop on the way in from the airport to collect a six pack of water. Always make sure water bottle is still sealed. What to pack - Comfortable, casual and light clothing. Well-worn walking shoes or sneakers are always a good idea. A fleece lined track suit is perfect if it gets chilly in the evenings and does not crease in your suitcase. Take insect repellent and protective wear for the tropical sun and rain, hats, sunglasses & Sun Screen block creams. A small back pack (hand luggage) is always ideal for carrying your small personal items. Flights - Selftours normally uses Mango airlines which is the only direct flight from Johannesburg to Stone Town on Tuesdays, Thursday & Saturdays. However, you can choose to be route via Dar Es Salaam and use the high speed ferry operating between Dar and Zanzibar Island.